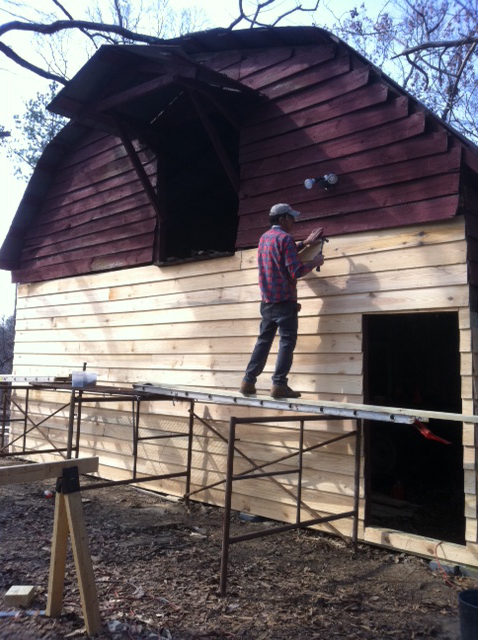 We finished all but the cosmetic work at the barn and the creative space today. We'll paint the new wood over the coming weeks and begin the task of cleaning up and out both spaces. It's been hard work. I got my hands dirty and I whacked my thumb more than once. But the longer I worked, the better I got at measuring, cutting, nailing, and placing. My carpenter is a down-home philosopher. Just watching him work was like watching an artist. His moves were calculated and deliberate...no wasted energy. When he measured, he jotted the number with his carpenter's pencil on the wood so that if I forgot, he didn't have to remeasure. As we worked over the past few weeks, I picked up bits and pieces of his life story. He grew up hard. His dad left their family when he was a kid. He wanted to go to school, but he had to work to help put food on the table. So he spent his life building things and he learned his craft well. These last few weeks has been a rewarding experience. Doing the repair work on the old house and barn has had two payoffs. 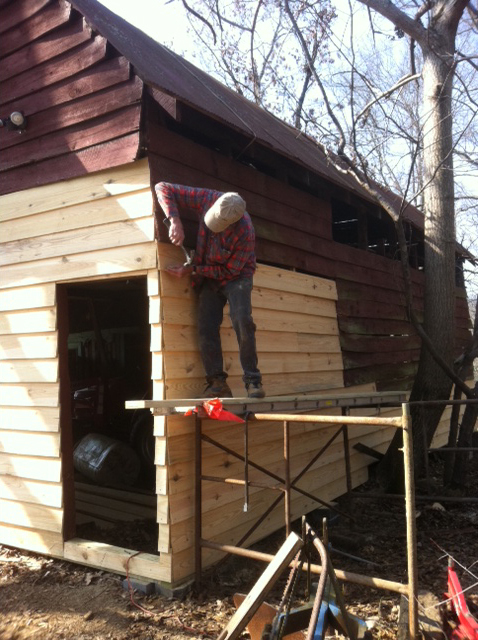 One was the obvious -- we now have a creative space and a solid barn that will be here as long as we have a use for it. The second was a chance to get to know a remarkable individual. And to hear a story that few people have heard. Hi Rick! I noticed you were a follower and I just wanted to stop and say thanks and to visit your blog. It's really great! What a wonderful project you're involved with. Looks like it will be beautiufl when finished. Also I've noticed that you are having better weather, even with the little bit of snow. I'm just jealous! Have a great rest of the week! You must feel so good that progress is being made. You got a lot done in a short time it seems to me. It looks great. It must have been a special experience indeed to work with the talented carpenter as well as participate in the bringing a great barn back to good use. What an amazing man! He certainly looks as if he has a few wonderful stories to tell!! 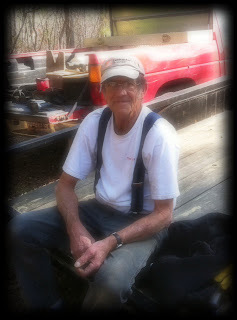 I always enjoy visiting with the various craftsmen who work on projects on our house. I know they probably think I am a pestilence, but I like to engage strangers in conversation. I am glad you got the man to open up and share about his life. It makes one feel important to know someone cared enough to ask. Love it that you finished the construction, but I imagine the hard work is just beginning. May you find no ugly surprises as you shovel your way out! :) It sounds like a job I would love to do. I love meeting people this way. He was happy to talk, and you were the perfect listener. And congrats on getting your work done. Looks terrific! The tree seems like it belongs. Your carpenter seems like a wonderful person!